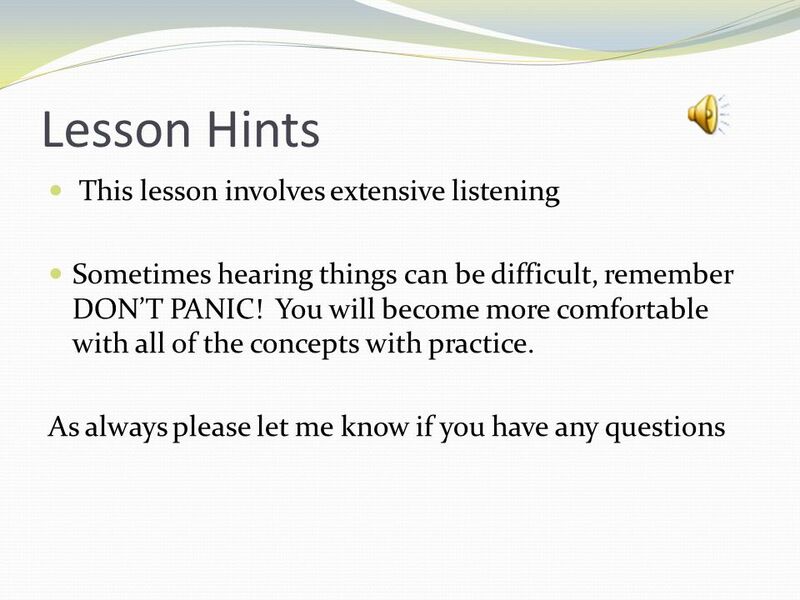 Unit 3 Ear Training Basics. 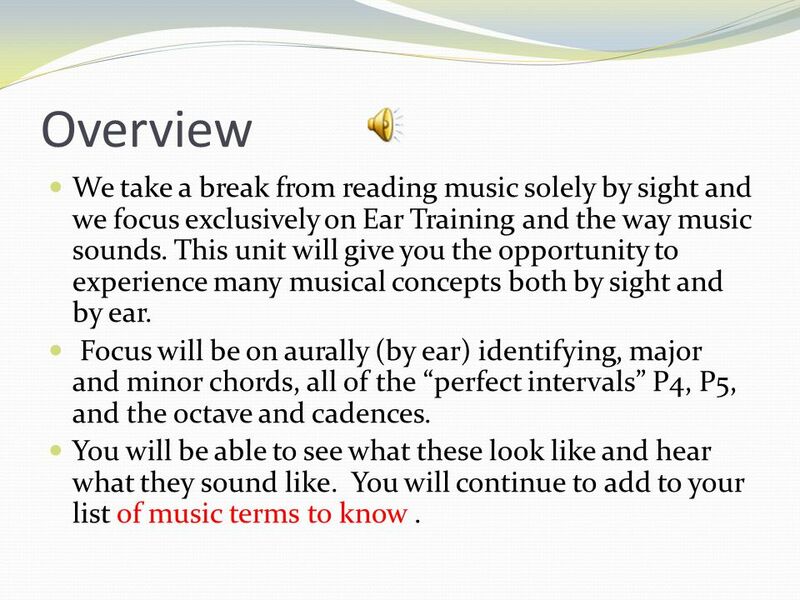 3 Overview We take a break from reading music solely by sight and we focus exclusively on Ear Training and the way music sounds. This unit will give you the opportunity to experience many musical concepts both by sight and by ear. 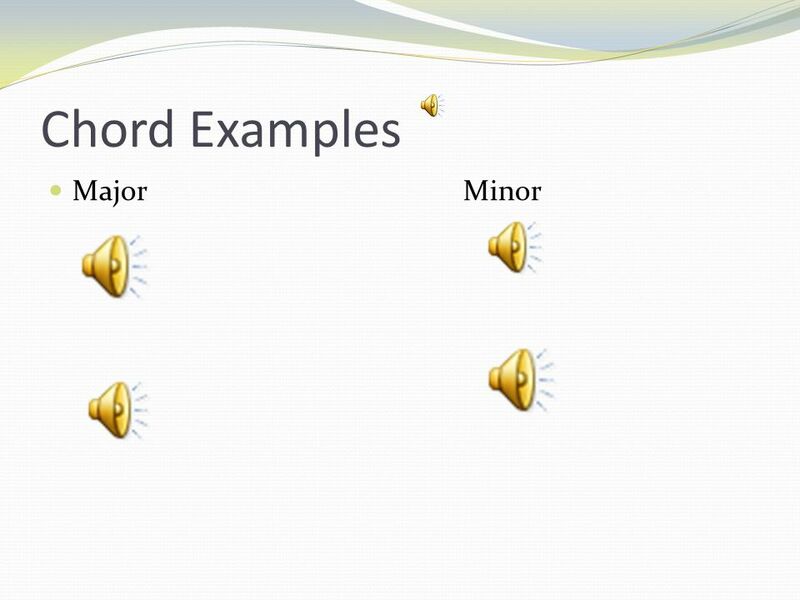 Focus will be on aurally (by ear) identifying, major and minor chords, all of the “perfect intervals” P4, P5, and the octave and cadences. You will be able to see what these look like and hear what they sound like. 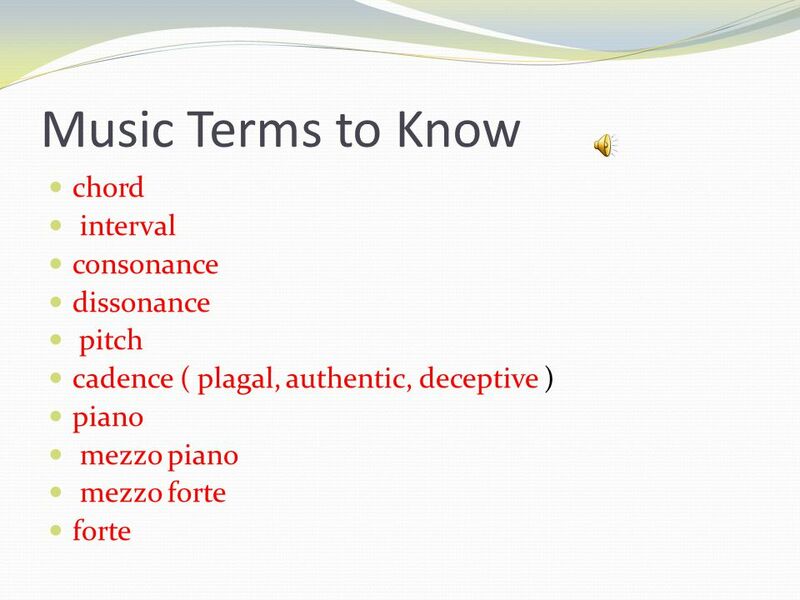 You will continue to add to your list of music terms to know . 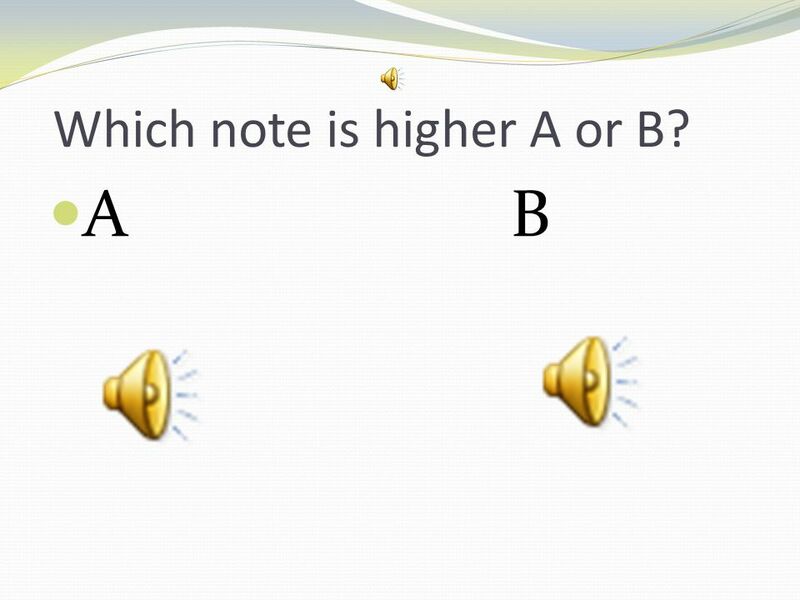 6 Which note is higher A or B? 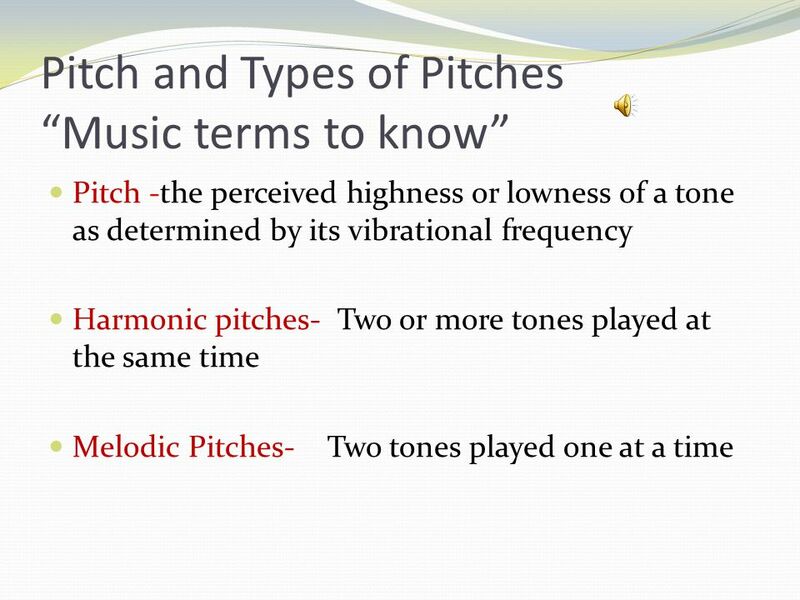 7 The next slide will give you the definition of pitches. 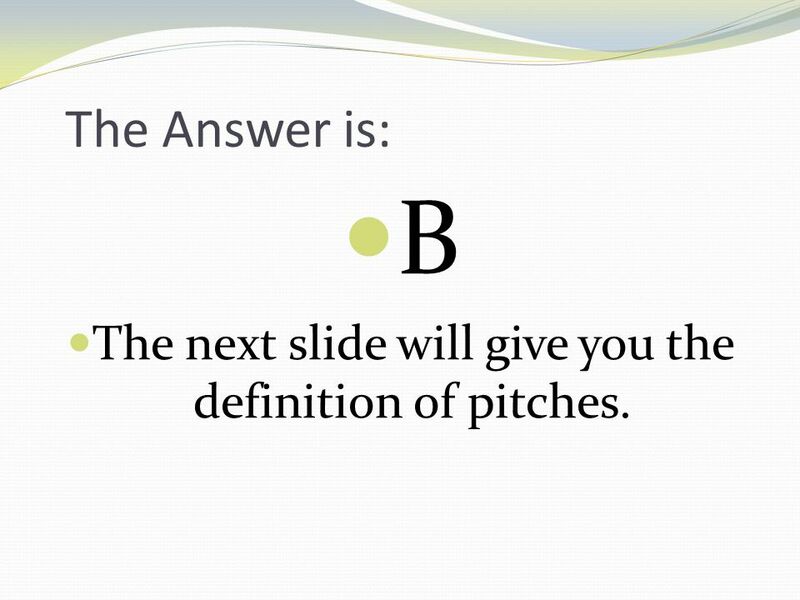 The Answer is: B The next slide will give you the definition of pitches. 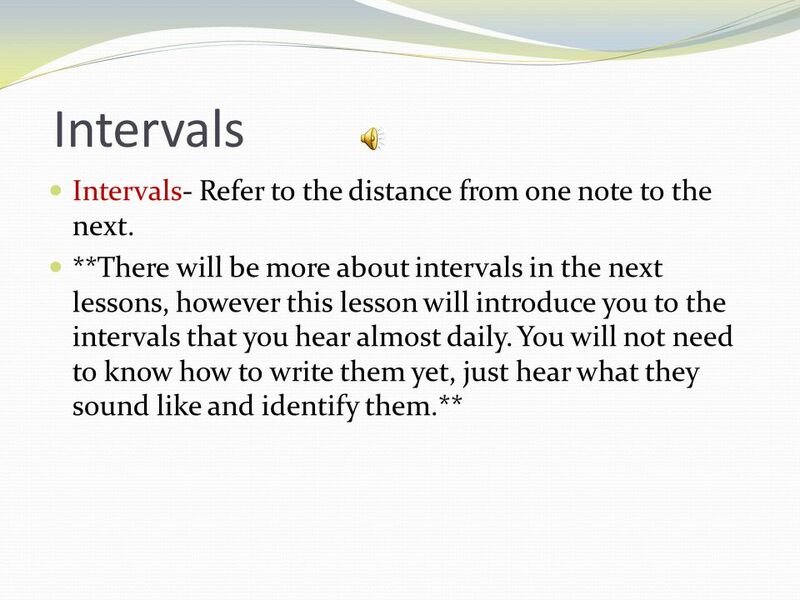 12 Intervals Intervals- Refer to the distance from one note to the next. 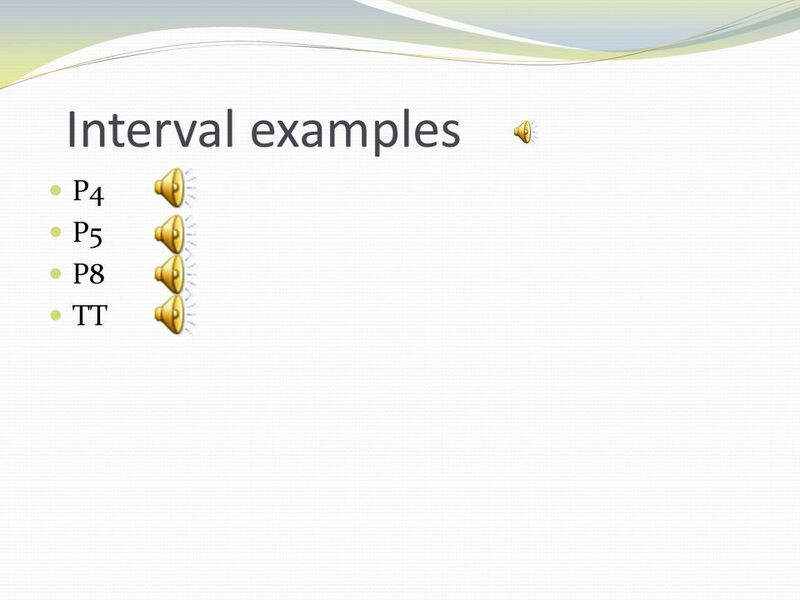 The dissonant interval we will cover in this lesson is the tri-tone. 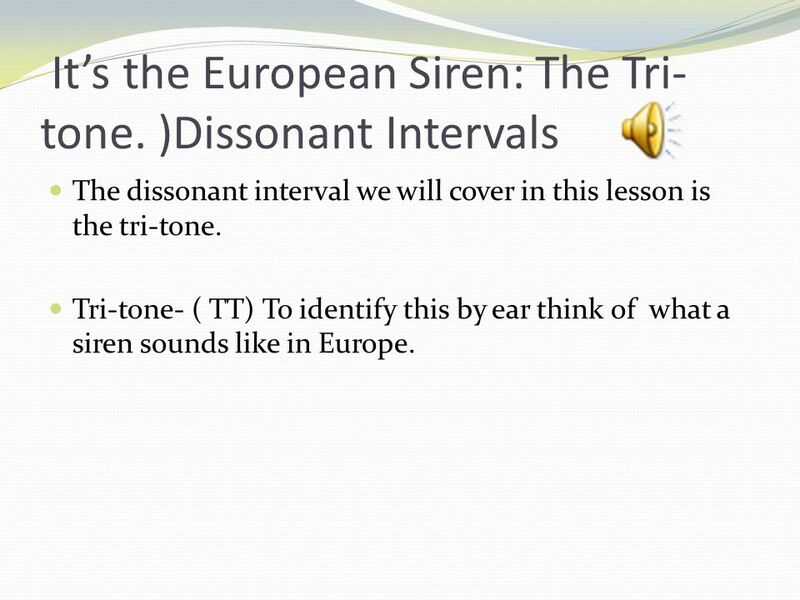 Tri-tone- ( TT) To identify this by ear think of what a siren sounds like in Europe. 21 Congratulations! 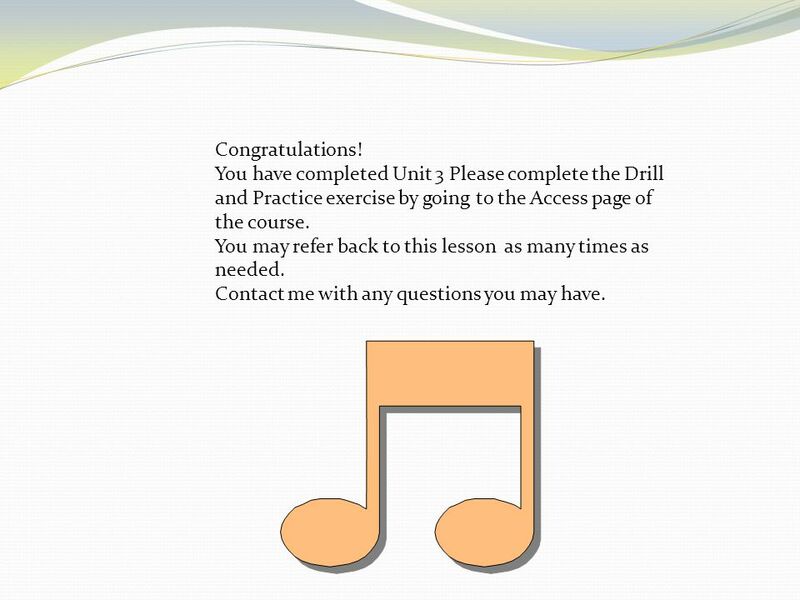 You have completed Unit 3 Please complete the Drill and Practice exercise by going to the Access page of the course. You may refer back to this lesson as many times as needed. Contact me with any questions you may have. 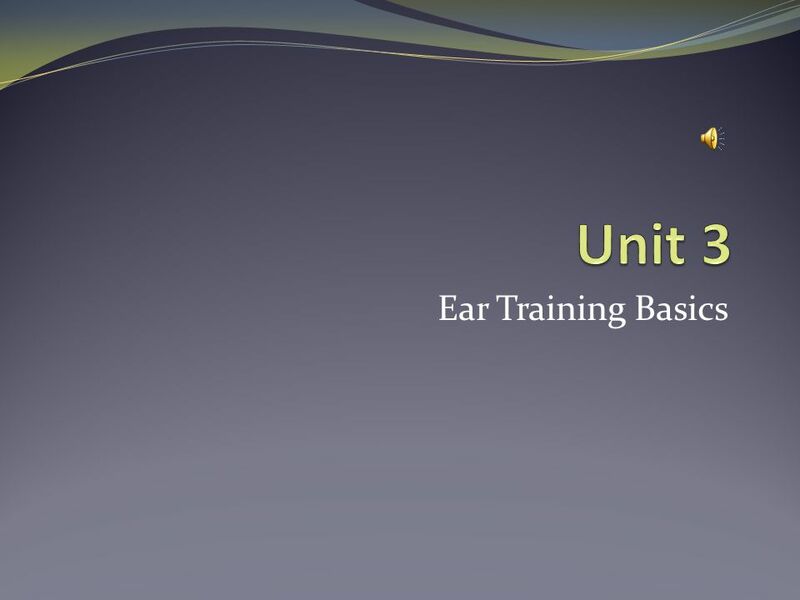 Download ppt "Unit 3 Ear Training Basics." 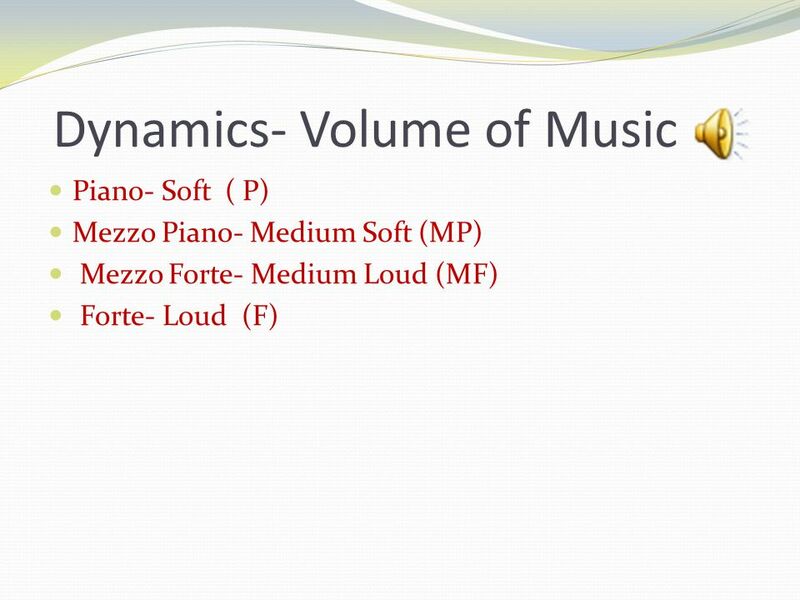 This lesson is teaching 8th grade students about dynamics and tempo. Musical Terms Instead of the usual handheld flashcards, I projected these from my computer. Easier to use, always stayed nice, and all students could see. 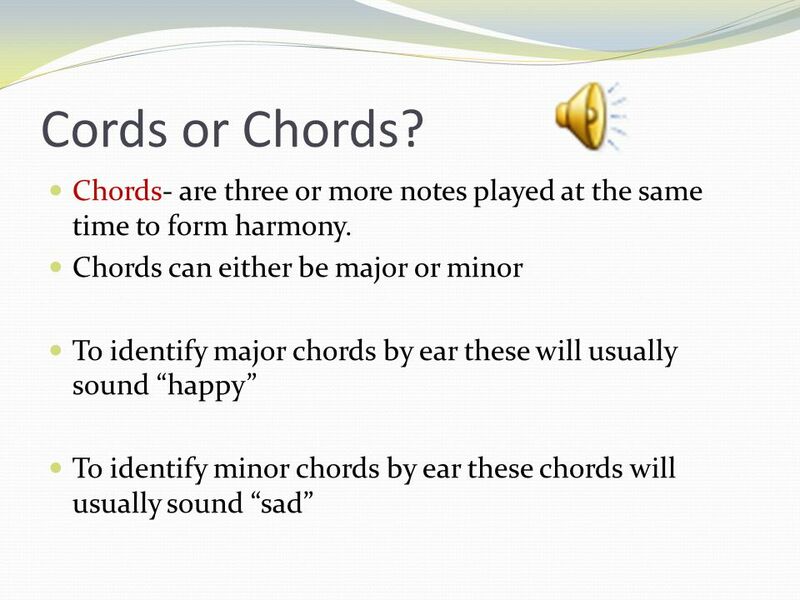 Music Introduction to Humanities. Music chapter 9 Music is one of the most powerful of the arts partly because sounds – more than any other sensory stimulus. Mr. Jackson AP Music Theory. 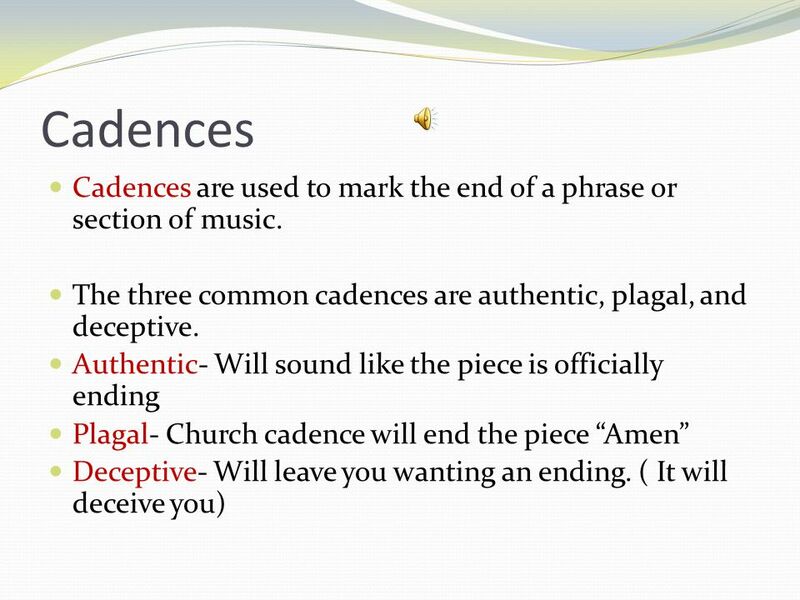  A cadence is the harmonic, melodic, and rhythmic conclusion to a phrase. It also helps to establish the tonal center. It. Sound Sound is a form of energy. It comes from a vibrating source. Sound travels in invisible waves. Sound can travel through solids, liquids, and gases. MUSIC A Universal Art © 2006 EvaMedia, Inc.. An interesting fact … Italian Italian is the ‘language’ of music Many of the terms used to describe elements. 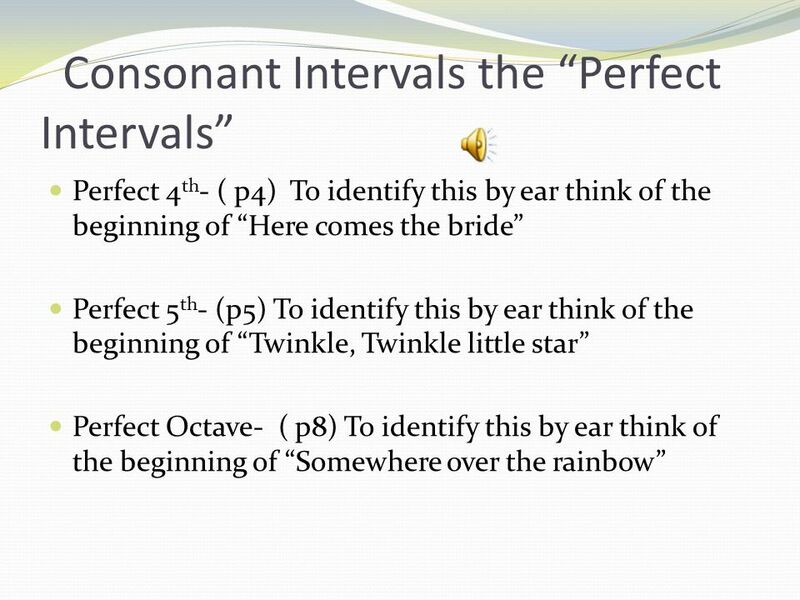 Scales & Intervals Theory I 9 th grade Ms. Wasko. Sept. 6/11. 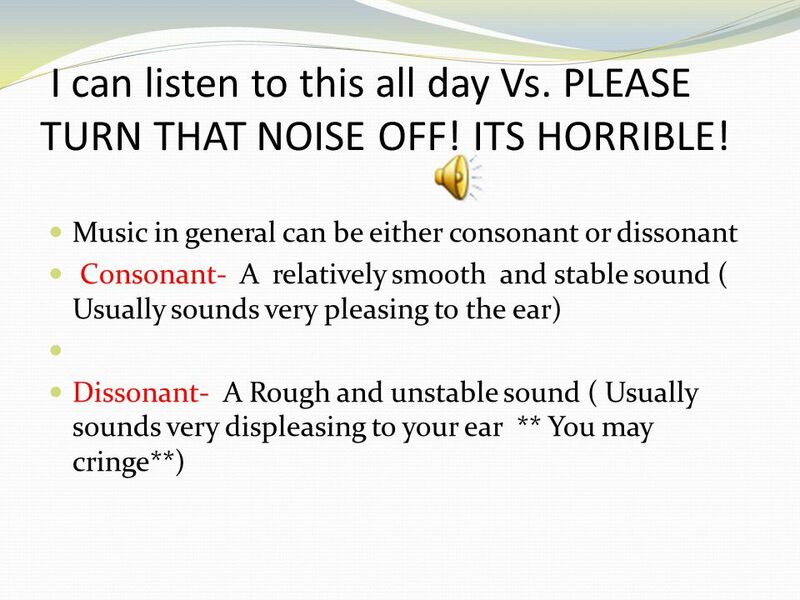 - Sound Sounds may be perceived as pleasant or unpleasant. What are these sounds that we hear? 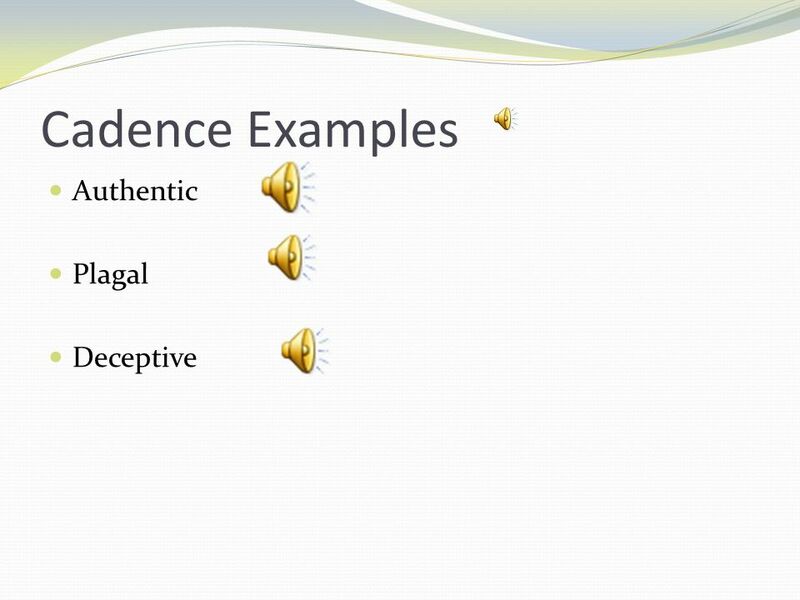 What is "sound"? What causes it, and how do. 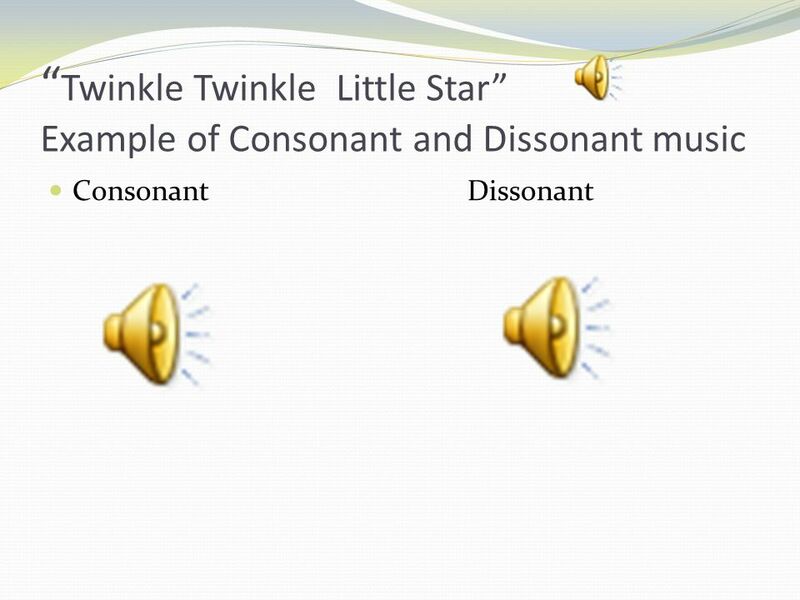 Timbre (pronounced like: Tamber) pure tones are very rare a single note on a musical instrument is a superposition (i.e. several things one on top of. 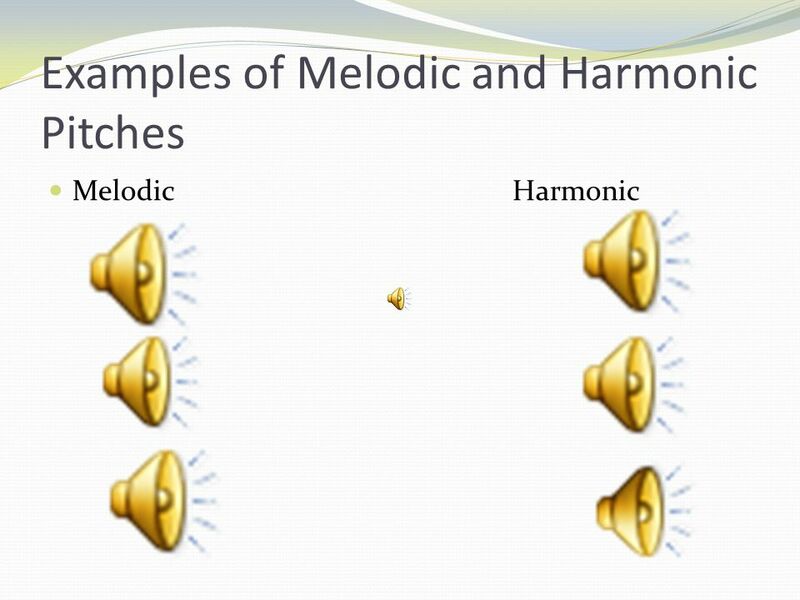 What are harmonics? Superposition of two (or more) frequencies yields a complex wave with a fundamental frequency. Meters Simple meter: Simple meter: Duple, Triple, Quadruple Compound meters: Compound meters: Sextuple = Compound Duple Sextuple = Compound Duple 6 beats. 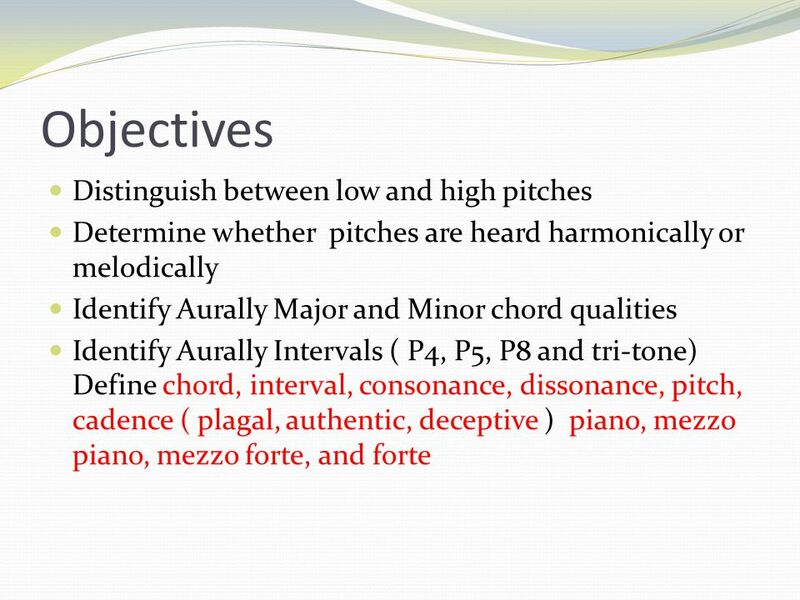 AP Music Theory Elements of Music: Pitch. IB and AP  This class will get you through the material you will need to accurately analyze a piece of music. Click to proceed to the next page1 Piano/Theory 4 PACING GUIDE Quarter 1.